I’ve been a fan of Hope Gillerman’s line, H. Gillerman Organics, for a few years now. Hope is always at work with me via her Tension Remedy, an office staple; she’s also always by my bedside via her Sleep Remedy, an incredibly soothing mix of lavender, blood orange and clary sage. Today, Hope is on my blog sharing her approach to clean, simple skincare and is inspiring me to become less of a product junkie and more of a pared-down princess. Who knows if I’ll ever rid myself of my product junkie ways (I’m a blogger, after all!). But with Hope’s story today, I’m seeing how I can find harder-working, multipurpose products to streamline my routine, saving time and money while still supporting the beautiful brands I love. I was a beauty product junkie in my youth and my skin and health suffered painfully. Now, I take my time trying new lines, look for multi-tasking products and keep my routine super simple: Cleanse/hydrate and exfoliate/mask a couple times a week. I confess to my extremely discerning point of view, but I know this works best for me, and I can’t bear the smell of synthetic anything. I look for products that are preservative-free, toxin-free, perfume-free and with a bare minimum of chemist-altered naturals. I look for straight from the plant — no tampering with mother nature’s best — but with an evolved refinement. One of the big differences between facial creams and facial oils is that the former sits mostly on the surface to hold moisture in and the latter is absorbed into deeper layers of the skin to nurture and regenerate — but not if pores are blocked with pollution and dead skin! I am a big believer in very gentle exfoliation, not skin-scratching scrubs — the word tells all. This very fine powder of oats and milk (lactic acid) does a fantastic job of sloughing dead skin to prepare the dermis to absorb the botanical oil in face oil. I put some in a small cardboard tube (lip balm size) for travel size. For luxury hair-care (and yes, I am worth it) I go to THE MAN: Horst Rechelbacher. A hairstylist before he created Aveda, I trust Horst’s ingredients more than any other hair care products. I find others are always sneaking in preservatives, emulsifiers and perfumes while claiming green. I pour into small travel bottles and pack in my waterproof, zip-close cosmetic bag so I have it wherever I go and don’t worry about spilling in my suitcase. At home, I keep the shampoo and conditioner in the shower. Morocco may be the home for the miracle argan oil, but not all are sourced and maintained as perfectly as this brand does — I completely trust founder Katharine L’Heureux. This is a truly 100 percent organic, unadulterated product, providing the optimal healing benefits. Because of the high levels of vitamin E, EFAs and anti-inflammatory soothing effect, I am using it right now to make a special healing salve with Helichrysum Serotinum essential oil for my Mom who just had a spot removed from her face and wants to have an invisible scar. Love this oil! Too precious to carry this gorgeous bottle around. I use it at home, a few drops at a time, as an eye serum that works in perfect harmony over my HGO Neroli Face Oil. There are so many ways to use argan oil; everyone should have it as a staple. The main thing about using face oils is not to slather them on, but to use 5-8 drops, tops, and massage into damp, clean skin in upward strokes. To seal in moisture, instead of overdosing on face oil, I apply a thin coating of my HGO Face Balm, warmed and dissolved in my hands first — patting and lightly stroking on dry patches with a very thin coating of the balm. Makeup goes right over it. 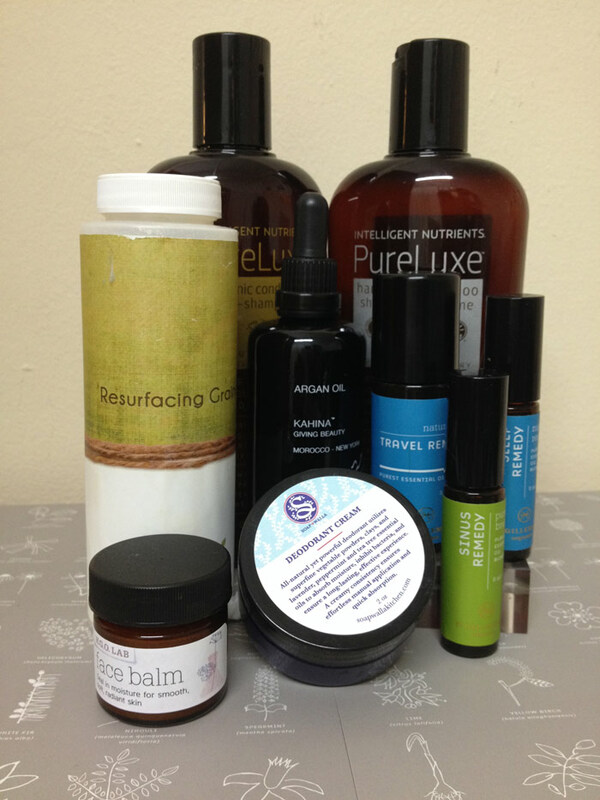 The regenerating/healing power of balms can go way beyond creams. Green makeup artist Jessa Blades suggests detoxing your personal care routine by starting with the armpit/breast and eliminating antiperspirants that clog up the important area. For me, this essential oil-loaded balm has been a lifesaver for my feet since I live in my cloth Toms shoes, which can cause foot odor when you wear them barefoot! I put this on in the morning after the shower, making sure to spread between toes — it is a natural anti-fungal. I use all of it! Again, because Rose-Marie Swift — a brilliant makeup artist who understands skin has to GLOW to look young — sources only the best ingredients. My skin never gets clogged, dry, erupted or hidden by these brilliant balms, powder and coconut oil and the concealer works to block the sun (I am allergic to sunscreen). I always include an almost finished jar of “Un” Cover-up #22 in my small Alison Oliver-illustrated, gold zip-up Baggu leather pouch that includes: HGO Sinus and Tension Remedies, my lip/hand balm and a nail clipper (gotta keep my nails as short as possible since I do healing touch). These are my travel but also my basic combo for fall because they support the immune system, detox with every use, boost energy and help the mind/body adjust to shifts in temperature and climate. This time of year is the hardest on my health — more prone to pick up a cold, strain a muscle or get overwhelmed, so I rely heavily on these remedies to get me through, and so far they have succeeded in preventing me from getting sick/jet-lagged/slowed-down by stress, achey or weary. I never leave home without it. I keep it — bottle only — in the Baggu bag which sits at my hip for easy-access in my cross-body wallet/mini-everything bag. This way I can access instantly while standing on a subway platform, on a plane, when somebody sneezes in my face (!) or around lots of kids — anywhere where I need some anti-viral/bacterial armor. For my morning does of inspiration, I put a drop inside each nostril. And if I am getting a sore throat or feeling on the verge of ill, I put a couple drops on my neck over my lymph nodes, and I am good to go. Helps me meet the challenges and stresses of fall head-on since it is an adrenal stimulant, immune booster, deepens breath, clears the chest and helps me get unstuck from the kind of obsessive thinking many of us are prone to. I roll on neck, shoulders and low back after the shower. If my legs are tired or sore, I roll on in stripes and smooth in like a lotion, targeting sore areas, or take a bath in it. I keep a bottle on my dresser or in my bathroom and always pack in my leak-proof cosmetic bag when traveling. To eliminate jet lag when used day of travel and three days after. These days I alternative this roll-on with Chest Remedy every 3-4 days. This is a great bath oil too. It helps with adjusting to seasonal change, relaxes and soothes muscles and balances my psyche. Recently I have been rolling on my right knee which seems to have trapped fluid caused by a big giant dog ricocheting off me during Mary Martin’s morning walk in Fort Greene Park.